NAFSA members are invited to subscribe to a full year of access to the online Journal of Studies in International Education, an outstanding source of peer-reviewed analytical, historical, and experimental research, reviews and case studies on all facets of internationalizing higher education. 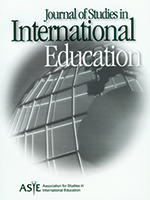 Published five times a year, it is the official journal of the Association for Studies in International Education (ASIE). NAFSA and its sister international education associations around the world formed ASIE to sponsor a research journal for the field to highlight contributors from various countries and world regions. This price is available to NAFSA members from SAGE Publications, the publisher of the Journal of Studies in International Education.